When Midland drivers think about preventive maintenance, what usually comes to mind is oil, fluids and brakes. We don't generally think about our shocks or struts, but these auto parts keep our tires on the road. Midland drivers don't think about shocks as often as oil changes because shocks and struts last a long time and wear out slowly. They don't need to be checked as often as our brake pads or air filters. By the time your shocks have 50,000 miles (80,000 kilometers) on them, their performance will have noticeable degraded. If you want to restore the handling and ride designed for your vehicle, try replacing your shocks and struts. Of course, if you drive off-road around Midland, carry heavy loads, tow a trailer or put in a lot of mileage on poor driving surfaces, your shocks or struts will wear out more quickly. You'll need to replace them more often or upgrade to better shocks. Your suspension system uses springs and shocks to absorb the “shocks” and vibrations of driving over road surfaces. Springs support the vehicle's weight, suspending it above the axles so the body of the vehicle is protected from most of the bumps on the road. Shocks control the bounciness of the springs by moderating rebound. They also push your tires down onto the road's surface, maximizing traction. Without shocks, your wheels would bounce over bumps and lift against curbs and corners. Shocks are important to the safe handling of your vehicle as well as a comfortable ride. Struts are a combination shock and spring in one unit. Worn shocks result in lowered vehicle handling performance. If your vehicle “squirms” around corners or gets “floaty” over bumps, then you need to check your shocks. If the rear end of your vehicle squats while accelerating, the front end dips while braking, or one corner sags, you probably need new shocks. If you're unsure whether you need new shocks, or if you're considering upgrading to a higher quality shock, then consult your friendly and knowledgeable West Texas Automotive service advisor. He or she can give you advice on the condition of your shocks and how to match your driving needs to the quality of your shocks. At West Texas Automotive we know good vehicle care is essential to the safety, performance and efficiency of your vehicle. It can improve the comfort of your ride as well. During an inspection at West Texas Automotive in Midland, your friendly and knowledgeable automotive service technician will check for worn, broken or missing parts. You've probably heard of struts. They combine a shock absorber and a coil spring in one unit. Shocks and struts will wear out over time. If your tires develop a cupped wear pattern, your shocks or struts may be wearing out. This is from the shocks bouncing unevenly. You may notice a floaty or drifting sensation when cornering. If the front of your vehicle dives excessively when stopping, or rocks back and forth after you've stopped, your shocks may be worn out. And if they are leaking fluid, it's definitely time to replace them at West Texas Automotive. If you are experiencing any of these symptoms, visit West Texas Automotive for a suspension inspection. Same applies if you've been in an accident that involved one of your wheels. If your vehicle suspension actually fails, it could lead to a serious accident, so don't put it off. When you replace your shocks, it's usually a good idea to replace all four at the same time. That'll give you more even handling. Talk with your friendly and knowledgeable pros at West Texas Automotive because you don't want a big difference between the performance of your shocks from wheel to wheel, and replacing all may be the safest bet. There are different grades of shocks and struts. You always want to use a replacement shock or strut that equals the one that came as original equipment when your vehicle was new. But remember, they were designed to meet the expected needs of the broad range of Midland people who buy that particular vehicle. Your needs may be more specialized. For example, if you want increased handling performance, your West Texas Automotive service advisor can recommend an upgraded shock or strut specially designed for improved handling. If you haul heavy loads or trailers in Midland, we can recommend some heavy duty shock absorbers. A good suspension system gives a vehicle a smooth, even ride while providing Midland drivers with good handling and control. But like any system on your vehicle, parts of the suspension system can wear out, leading to a lower ride quality and safety concerns. So it's a good idea for drivers in Midland to remember their suspension system in their schedule of preventive maintenance. Springs do most of the work of the suspension system. The most common types of springs are coil and leaf, but air springs and torsion bars are becoming more common. The body of the vehicle is “suspended” by the springs. If springs were the only working component in your suspension system, however, you'd spend your travel time bouncing up and down like a bobblehead. That's where your shocks come in. They keep the rebound, or bounciness, of the springs under control. Shocks also keep your tires on the road, which keeps the driver in control of the vehicle. 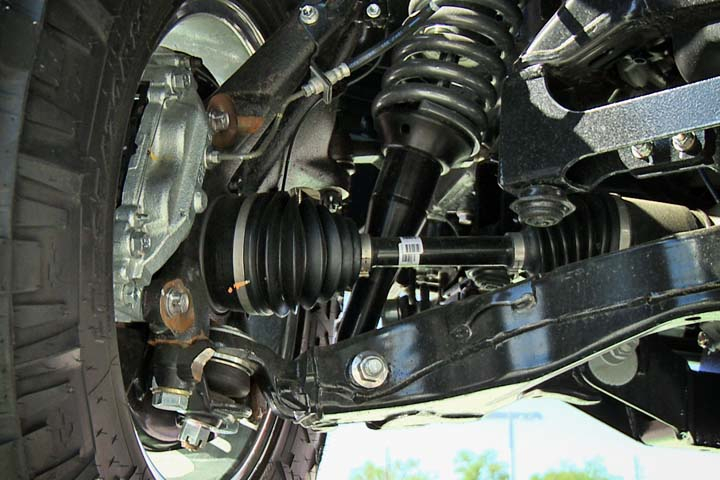 Some vehicles have struts in their suspension system. Struts are a compact combination of springs and shocks. They do the same job but in a single package. Shocks wear out gradually, so it can be difficult for Midland drivers to notice when they need to be replaced. There's no definitive point when a vehicle's ride goes from "smooth and controlled" to "a bit imprecise." To check if your shocks or struts are worn, you should first do a visual inspection on them. If they are leaking fluid, they need to be replaced. There are other less obvious signs that your suspension system needs attention. For example, an uneven, cupping wear on your tires may indicate that your shocks are worn. If your vehicle feels “floaty” when you turn, or, in other words, you don't feel that you have full control of the vehicle, you should check your shocks. Also, if the front end of your vehicle dips noticeably when you stop, it's time for new shocks. Your owner's manual gives recommendations on how often the shocks should be checked, usually between 15,000 and 30,000 miles (24,000-50,000 km). If one of your shocks does need to be replaced, you should replace all four. This will keep your suspension even and ensure good handling of your vehicle. If you carry heavy loads, tow a trailer or drive on uneven Midland area terrain, you might also consider upgrading to a heavy-duty shock. Regular shocks contain hydraulic fluid. The fluid helps them absorb the bumps or “shocks” of the road so the impact doesn't transfer to the vehicle's body. Premium shocks are filled with compressed nitrogen gas, which costs more but does a better job of controlling body motions. Regular shocks can develop air bubbles that reduce their effectiveness; the premium shocks don't have this problem. So if you want higher handling performance, if you drive off-road around Texas or if you just want added comfort, you should consider upgrading to premium shocks or struts. Replacing struts can put your vehicle out of alignment, so an alignment check should always follow this type of repair. Talk to your service advisor at West Texas Automotive in Midland for more information. When they hear the word suspension, many drivers in Midland may think back to those energetic days of grade school. Well, your vehicle's suspension is actually a good thing because it keeps your vehicle up off the road and helps provide a comfy ride around Midland. Its job is to keep your wheels firmly planted over bumps and through curves. Your suspension system has many parts. If you look under your vehicle, it's basically everything that connects your wheels to the vehicle's frame. These are heavy duty parts that do a lot of work. They need to be inspected for damage and excessive wear at least once a year. A good time for this is when you get your annual alignment service at West Texas Automotive. Some suspension parts just wear out with use. Shocks and struts eventually lose their ability to control your ride. Wheel bearings need to be repacked every couple of years. And some suspension pieces need to be lubricated when you get your oil changed. Your service advisor at West Texas Automotive can perform an inspection and tell you what problems you may have. If you're in an accident, your suspension can be damaged or knocked out of alignment. Even a minor accident, like hitting a curb around Midland or even a large rock can mess things up for drivers. With a minor accident it's tempting for many to just get an alignment or wheel balance to correct the problem. But if there's damage, a simple alignment won't actually fix the problem, and you'll just have to align it again after the repairs are made. So if you have an accident, get your suspension system inspected right away. Suspension problems are a major safety issue because they can lead to unsafe handling. One big cause of suspension damage for Midland drivers is potholes – those nasty magnets that form in roads in freezing weather. They seem to draw our tires right into them. Here are some tips for avoiding damage from potholes: First, keep your tires at their full air pressure. That gives tires their maximum resiliency and will hopefully keep your wheels or other suspension parts from crunching on a big hole. Next, just pay attention. When you see a hole you can't miss, slow down before you hit it. Driving at a slower speed will limit the damage and may keep your drink from spilling. But avoid the temptation to brake directly over the pothole. That will cause the car's weight to shift forward and add to the potential damage.